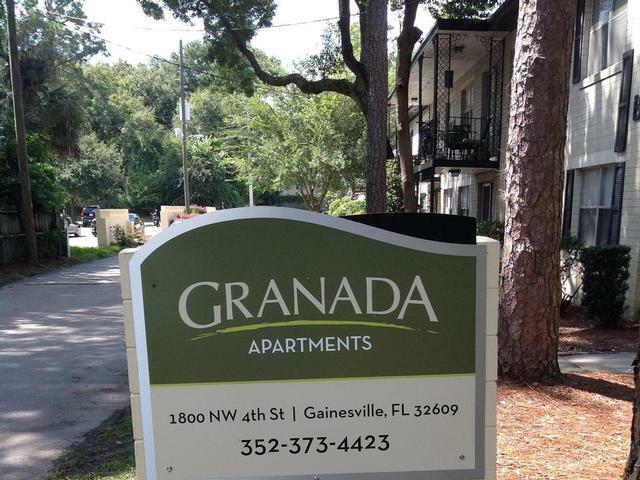 Granada Apartments offer students and professionals 2 and 3 bedroom apartments closest to the northeast side of the University of Florida in Gainesville, Florida. Individuals looking for a place to live that is close to the University of Florida campus but also seek a place that is quiet will find Granada Apartments an excellent choice. Public transportation options are available near this community, but residents with a car will find access to campus much quicker. Residents looking to catch the Gators in action for the big game can reach the Ben Hill Griffin Stadium in just over 10 minutes by car, or they can take the 8 bus and get there in a little under 40 minutes. The University Auditorium is also just a 10-minute drive by car for those who want to take advantage of a live performance. Plenty of dining options is within walking distance of Granada Apartments. Vegetarians will enjoy being able to walk 6 minutes from their doorstep to Civilization. This highly-rated local favorite restaurant is a cash-only, worker-owned establishment that serves only healthy fare including vegetarian options. For those seeking more casual dining, a Burger King, Wendy’s and Popeye’s are within the same area. No matter the dining preferences, everyone will find something they can enjoy in the area. Nature lovers can take advantage of Northeast Park which is a 12-minute walk or 3-minute drive from Granada Apartments. Residents can enjoy the picnic area, racquetball courts and the dog park within the park, and residents can get their much needed fresh air. Baseball games are also held at the baseball field in the park for those who want to enjoy watching or playing in a baseball game. Shopping is also conveniently near Granada Apartments. Residents can drive 3 minutes or take the 15 bus for 26 minutes to Gainesville Plaza. An active shopping center, Gainesville Plaza has a wide range of retail shops such as Ross Dress for Less, Burlington Coat Factory and Urban Thread that ensure that all visitors will be able to keep moving fashion forward. A number of amenities await residents of Granada Apartments. Each unit has washer and dryer hookups, appliances and hardwood floors to make residents feel right at home. The community is also pet-friendly which means that furry friends are welcome to move in, too. With its convenient location to shopping, convenient access to campus and the community’s amenities, residents will love living at Granada Apartments.